Fiji and Germany will continue to work together in the lead up to the climate change negotiations in Bonn, Germany in November. The German State Secretary for Environment Jochen Flasbarth is in Fiji and met with the Prime Minister Voreqe Bainimarama yesterday for a series of meetings regarding COP23. 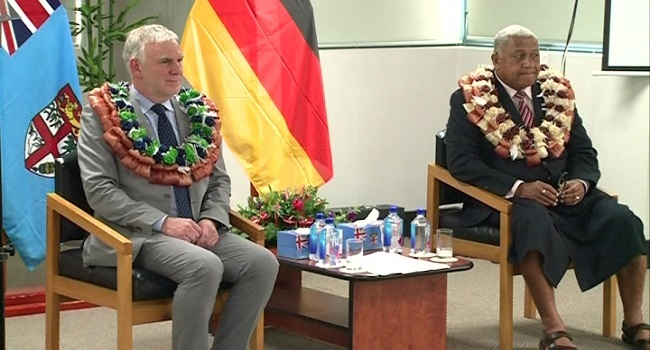 Bainimarama says Germany’s support to Fiji has been great and this was further enhanced today. Flasbarth says Germany will continue to support Fiji as it prepares to chair the climate change talks. Over 20,000 people will converge at Bonn for the COP23 meet.